Hosting a holiday party this season? If we can offer you only one piece of advice, it’s to set up a bar area so that your guests can serve themselves. Between taking coats and passing out hors-d'oeuvres, you’ll be as busy as can be—you won’t want to be tied to your cocktail shaker all night. We recommend batching a specialty cocktail, making red and white wine readily available, and then keeping a few cocktail ingredients for classic, simple cocktails like an Old Fashioned or a on-hand, so guests can make what they desire. 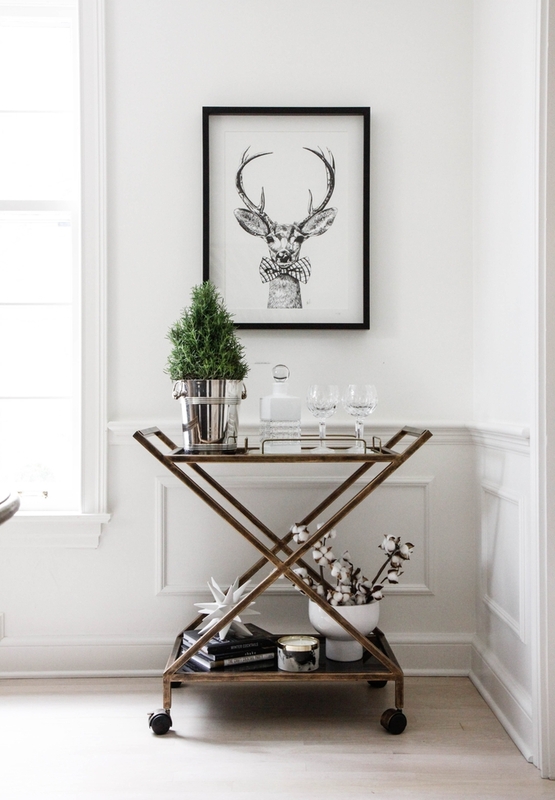 Once you’ve stocked up on all your seasonal beverage essentials, you’ll want to style your bar area so it feels festive and chic. 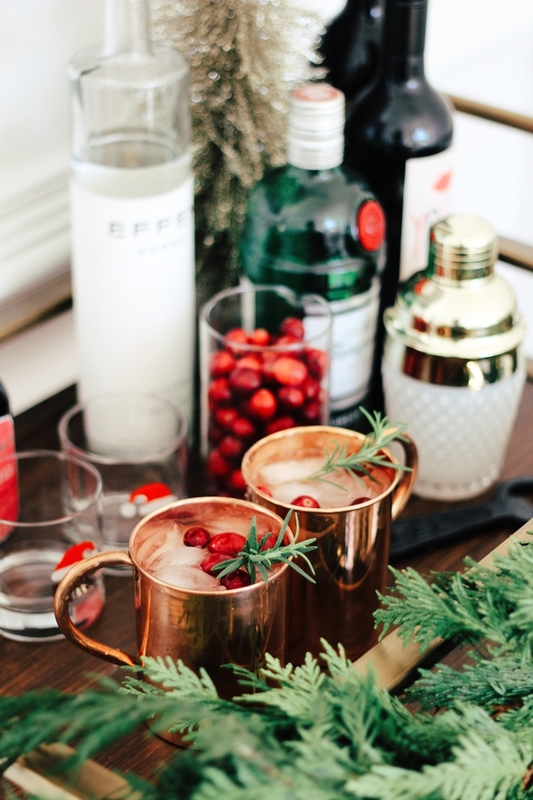 Read on for a few ideas for the most beautiful holiday bar. Garnishes like cranberries, raspberries, and sprigs of thyme are an exciting addition to your bar that will put your guests in a festive mood, as well as bring a flash of holiday color and style to your bar. Choose a clear glass vessel like a cylindric vase to store these, so their bright colors will be on full display. 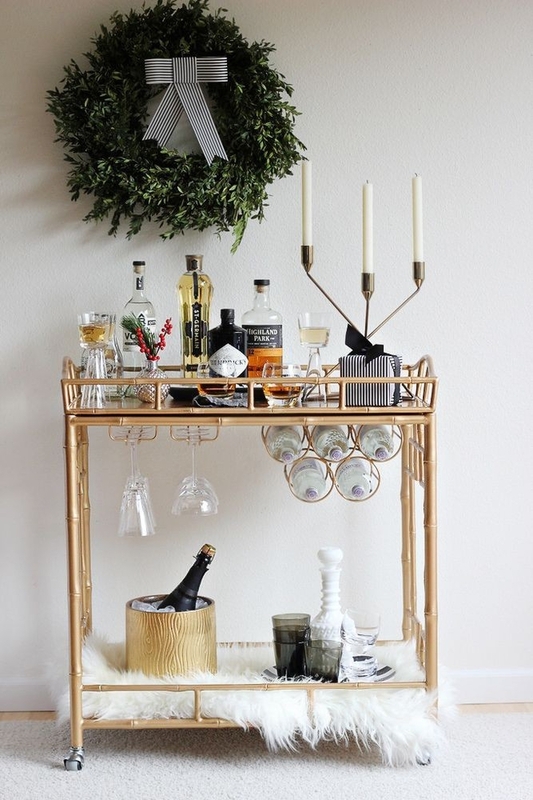 Whether you have a bona fide bar cart, or you are just styling up a corner of your countertop, you can make the place a destination by draping a holiday garland across the bar. We love a garland accented with fruit or ribbon, but a simple fir or magnolia leaf garland will also always look chic. 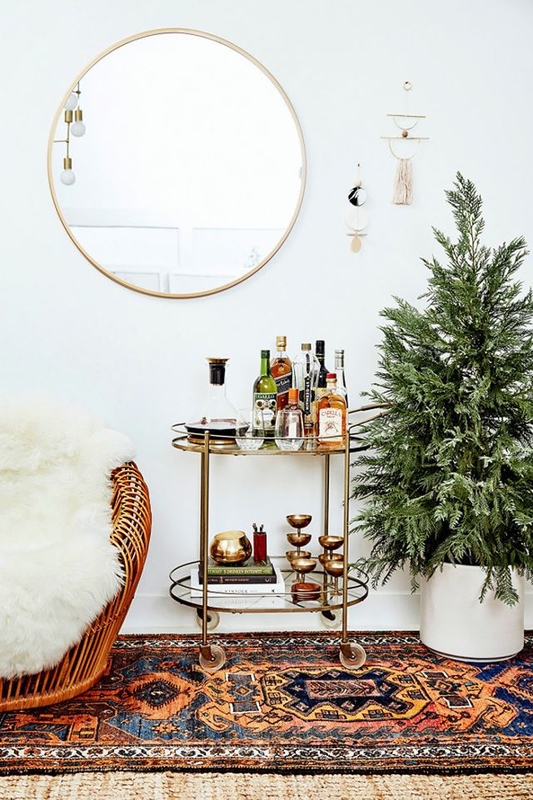 A sheepskin throw is an elegant accessory that can contribute a wintry touch to your holiday bar. Obviously, it’s not the most waterproof of accessories, so if you use one, tuck it on the lower shelf of your bar cart, across the back of an adjacent chair, or put a sheepskin rug on the floor in front of it. If you have room for a miniature Christmas tree or even an herb shrub, it’s a great way to fill dead space on your bar and add a bit of seasonal greenery. If you don’t buy a pre-potted tree, jazz yours up by placing it in a silver bucket or wrap it in a beautiful global textile such as indigo mud cloth. There’s something about metallics that feels decidedly festive, no matter what holiday you’re celebrating. Be sure to mix in metallics like silver, gold, or bronze—even rose gold would feel fresh—to guarantee a little sparkle here and there. 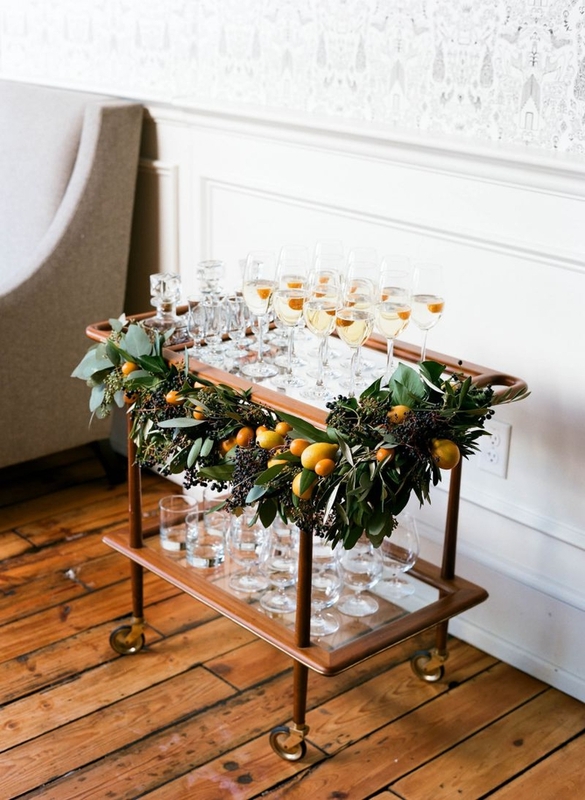 A gilded bar cart is always a good idea, but we also love vintage brass goblets, low-ball glasses rimmed in gold, or silver candlesticks here and there. Have a question about how to style your own home? Visit our Design Bar to ask a question—for free!—of one of our designers.